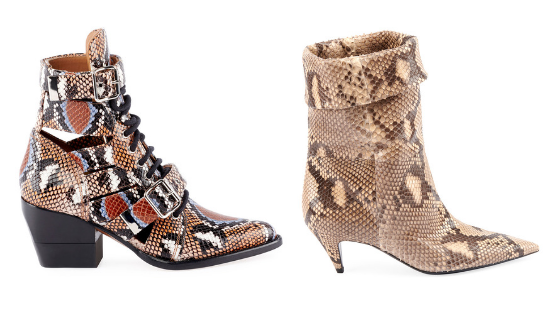 Python shoes are everywhere. Have you noticed? Maybe it’s because I have been living in a bubble, but I’m taken aback by how popular the shoe is. An odd pair in a Chloé store is a fun touch, but this feels like a collective cry for help. See, the thing is that I just can’t decide if I like it or not. Python, unlike warmer animal prints and leathers (like leopard or a sleek leather in luggage), is very white, jarring against most outfits and fully dated. So is this a trend that we’ll all soon regret? Or should I be all for ignoring the taboo of following seasonal trends because, in the end, everything is temporary and embracing the absurdity of python is a way to accept the fleeting nature of existence? Am I thinking too much into it? This is sort of like one of those songs that you’ve never heard before then all of a sudden, it’s EVERYWHERE before you get a chance to decide whether or not you like it. (I’m looking at you, Mz. Grande). These Gucci slide mules are kind of wearing me down. I think I might love them? And the dark brown spots on these Manolo slide sandals are large enough that they almost feel like an abstracted print designed after python. If I AM embracing it, here are a few pairs that I could see myself with. Brother Vellies- This kitten heeled mule has such a small profile that the python serves as a small but impactful accent in the overall look. I’d likely pair it with a wide leg trouser, so it’d truly just be a pop of python toe box when in motion. Or maybe posing for the ‘gram. Yeezy- The oblong heel and fitted profile of the shoe makes this quite a statement heel. I don’t think you can rely on the python print itself being the special element in a design, and this silhouette really does it for me. Chloé- The firey color-blocked gradient along the scalloped edge of this Chloé mule makes the python almost feel like a neutral in this design. The shoes got a retro feel and, again, the addition of the two other design elements gives it a distinctive point of view.